The side panels are insulated with noise-isolating materials to reduce noticeable fan noise. This essential if you’re building a media PC, and just plain nice if don’t want your system to contribute to environmental noise. The simplicity begins with tool-free 3.5” & 5.25” drive installation, and all four hard drive trays provide SSD support so you can mix and match to fit your needs. On the outside, dual USB 3.0 front panel ports give you quick and easy access to the latest high-speed portable hard drives & flash drives. For maximum airflow the 100R comes with two 120mm corsair fan included, this allows for the hot air generated from your PC's components to be directed out of the case. 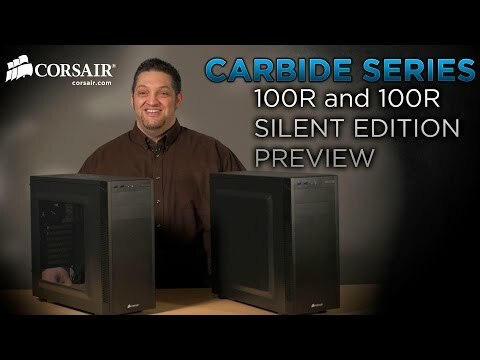 Corsair Carbide Series 100R Silent Edition Mid-Tower Computer Chassis with USB 3.0, Cable Management & Sound Damping is rated 4.0 out of 5 by 7. Rated 4 out of 5 by gzdseh from Not really suitable for a gaming case I don't understand why Corsair have named this as a gaming case. Most gamers want low noise sure, but they also want good cooling so having just one fan out-take on this case simply isn't enough. You can get away with it with the fan on max, but the lifespan of components is less with running in such heat. You may try fitting a faster louder fan, but then that defeats the object of having a quiet case. There could have been a panel fan, and the sound dampening could have been placed around the fan, as opposed to just a small quare dampening pad which they come with. Wish I had bought a proper gaming case now, but I do like the case, and it's quiet when not gaming. I just keep my room window open when I'm gaming, else my 1080ti would melt. WIll invest in a better faster fan and I may cut out a fan hole in the side if I get time/tools to do it. Rated 5 out of 5 by StevoA from Great value case. Great case, great value for money and terrific service from Scan as usual. Rated 4 out of 5 by PhilOfficer from Get on the case This case was chosen by a "client" and I thought it would be very basic but I was blown away by the quality of the finish when it was delivered. It looks like a much more expensive case. It was very easy to build in with good cable management but the lack of rubber protection around the cabling slots is a disappointment. The sides are rigid enough but be wary of distorting them with too much pressure. The system installed runs fairly quietly with dual fan water-cooling and x2 intake fans but with sides in place it is virtually silent. I moved the front 120mm fan outside the case behind the front cover and added a Corsair an extra 140mm fan above it this seems to work well - an i5-6600 has an idle temperature of only 21C. Rated 4 out of 5 by Ray49 from new build perfectly adequate for non-gaming system although ended up changing the fans. Not that impressed by the switch at the back to control fans so took whole lot out and fitted new fans. Hard drive carriers plastic and not very substantial. No good for SSD drives unless put them in "back to front" so would need to open both sides to acccess. Rated 4 out of 5 by Dude1 from Good basic case Good case with enough room for basic gaming system. However, I did expect the panel to be made of thicker gauge material. Rated 2 out of 5 by FamilyTechGuy from A hassle to work with The case has cut too many corners for my liking. For starters the top of the case doesn't have enough room to easily orient the CPU power cable. An extra 20mm would have been sufficient to have the hole be above the motherboard making it significantly easier to install the motherboard. The clearance behind the motherboard is too small to allow even small cables to be routed without it becoming difficult to put the side panel back on. Installing an optical drive was easy but the quick release flap extends past the case making it tricky to put the side panel back on. The hard drive bay is simple to use, the lack of another one on top helps airflow which the case needs. With a few tweaks the case could be really good, but as it is I think it is not worth getting. There are better cases for the same money available.